Live, work and play in one of the best learning communities in Montana! The Helena Public Schools are accepting applications for a full-time Occupational Therapist for the 2019-2020 school year. The Helena School District is one of the top Districts in the State with innovative professional development activities, forward thinking leadership and a commitment to students that reaches far beyond the classroom. Helena is a diverse community, supportive of education, the advancement of its students and proud of the accessible, small town feel of the local public schools. Join our team where you are able to do what you love surrounded by students and staff that work hard during the school year and enjoy plenty of time for family and fun during the summer months. Position requires Montana Licensure at the time of employment. Entry-level salary is $39,697+ dependent on education level and applicable experience. The District provides a comprehensive cafeteria style bene t package which includes: retirement plan, sick and personal leave, tuition reimbursement, health insurance with dental and vision coverage, life insurance, long term disability insurance, long term care insurance, a section 125 plan and numerous tax sheltered annuities (403b’s). Required application materials include: completed district online application, letter of interest, resume and college transcripts. Applications accepted immediately. Screening of applications will commence April 1, 2019 and continue on an ongoing basis until this position is lled. Helena School District # 1 is an Equal Employment Opportunity employer. 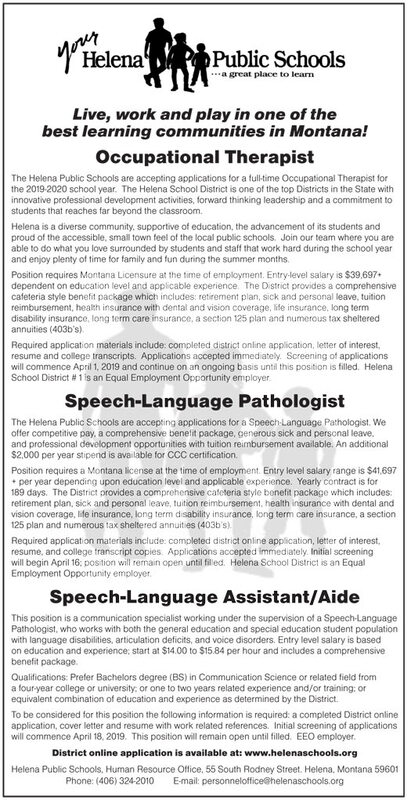 The Helena Public Schools are accepting applications for a Speech-Language Pathologist. We offer competitive pay, a comprehensive bene t package, generous sick and personal leave, and professional development opportunities with tuition reimbursement available. An additional $2,000 per year stipend is available for CCC certi cation. This position is a communication specialist working under the supervision of a Speech-Language Pathologist, who works with both the general education and special education student population with language disabilities, articulation de cits, and voice disorders. Entry level salary is based on education and experience; start at $14.00 to $15.84 per hour and includes a comprehensive bene t package. Quali cations: Prefer Bachelors degree (BS) in Communication Science or related eld from a four-year college or university; or one to two years related experience and/or training; or equivalent combination of education and experience as determined by the District. To be considered for this position the following information is required: a completed District online application, cover letter and resume with work related references. Initial screening of applications will commence April 18, 2019. This position will remain open until lled. EEO employer.